Home / What is Hair Loss? Hair loss is usually genetic in origin; meaning a person inherits the hair loss from both the mother and father. The hair follicles in certain portions of the scalp can be sensitized to the hair loss effects of several hormones. In men, this hormone, which is similar to testosterone, is called dihydrotestosterone (DHT). These “androgens” affect the hair follicles by causing them to have a shorter growth span, leading to withered, shorter, and thinning hair shafts. The reason men usually do not experience thinning hair on the back and sides of their head is because these hair follicles are not affected by the withering effects of DHT, and are considered “permanent” hairs. In women, there is a wider variety of hormones that cause typical female pattern hair loss, but the hairs on the back and sides, like in men, tend not to be affected. Rather, women tend to have thinning hair that’s spread diffusely on the center of the head. Men tend to start experiencing hair loss in their 30’s, 40’s and 50’s, while women usually start to experience thinning hair in their 40’s. Hair loss is diagnosed by observing the pattern of hair loss, and a determination of the amount of hair loss in family members. A microscopic exam of the hair, using an optical instrument called a densitometer, provides important information regarding what areas are experiencing thinning hair and which are not, as well as an assessment of the hair in the donor area on the back and sides of the scalp to determine one’s candidacy for a hair restoration procedure. 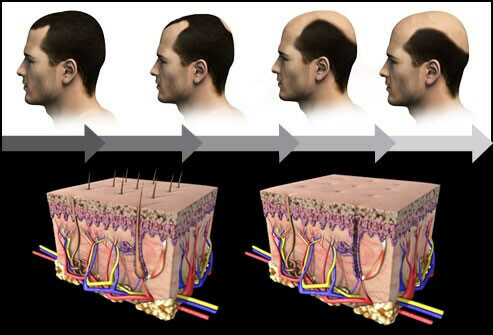 Hair loss can generally be classified into patterns, as shown in the diagrams below. For men, the Norwood Scale is used to classify various stages of hair loss, and for women, the Ludwig Scale is used. Of course, many people have hair loss patterns that do not match the diagrams exactly. In general, men tend to experience a receding hair line that turns into an “m” shape and thinning hair in the crown and front of the scalp. Hair loss in women can follow a similar pattern, but again, it’s more diffuse.